STOCKTON, Calif. — Mitchell Faccinto finally checked the Stockton Dirt Track off his list of winless tracks on Saturday night, picking up his first-career victory at the facility and becoming the fifth different winner in five Elk Grove Ford Sprint Car Challenge Tour presented by Abreu Vineyards races this season. Last year Faccinto led 29 laps during the Jimmy Sills Classic at Stockton, before Bud Kaeding got by on the final lap to steal the win away. This time around, Faccinto inherited the lead on lap 32 and led the final three circuits to pick up a $4,000 victory aboard the Western Metal Company/TSG Recycling No. 37 mount. Faccinto also began the night by setting a new winged 360 sprint car track record, with a sizzling lap of 13.679 seconds. The feature turned out to be a caution plagued affair, but in between the yellows and reds, the action was entertaining, as drivers made some wild moves on the four-tenths-mile oval. Shane Golobic executed a thrilling maneuver on the start to charge from third to first by the time the field reached Turn 2, while numerous competitors spent time running in the top-five, with positions changing hands on a regular basis over the course of the race. Cory Eliason and DJ Netto looked to be a couple of Golobic’s biggest challengers towards the halfway point of the race. That all changed on lap 17, though, when contact in turn three left both drivers parked off three and four, ultimately ending their night. After that Golobic held a steady lead over the field, until slowing with three laps remaining due to fuel starvation. At that point, Faccinto had battled his way forward and found himself in the race lead. Justin Sanders was also having a great run and restarted second, but issues after going back green caused him to slow and set up a green-white-checkered restart. During ithe two-lap dash, Faccinto hit his marks and took the checkered flag to score his first career Stockton Dirt Track win. Willie Croft was able to slice his way past brother-in-law Kyle Hirst to score the runner up spot at the helm of his Holy Smokes BBQ No. 29, while Hirst completed the podium behind the wheel of the Roth Motorsports No. 83 sprinter. Buddy Kofoid and Pit Stop USA Hard Charger Sean Becker completed the top five. Shawn Conde was sixth ahead of Colton Slack, Golobic, Austin Liggett and Andy Gregg. 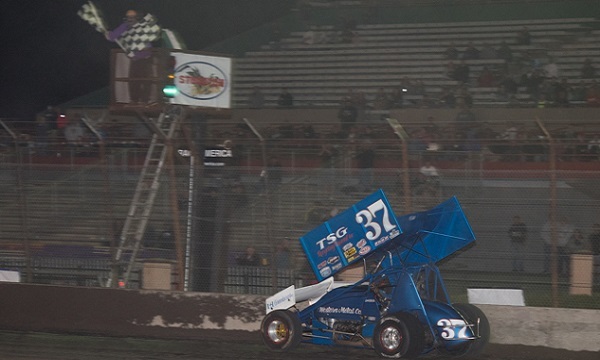 The Elk Grove Ford Sprint Car Challenge Tour presented by Abreu Vineyards returns to action on June 17 at Antioch Speedway.